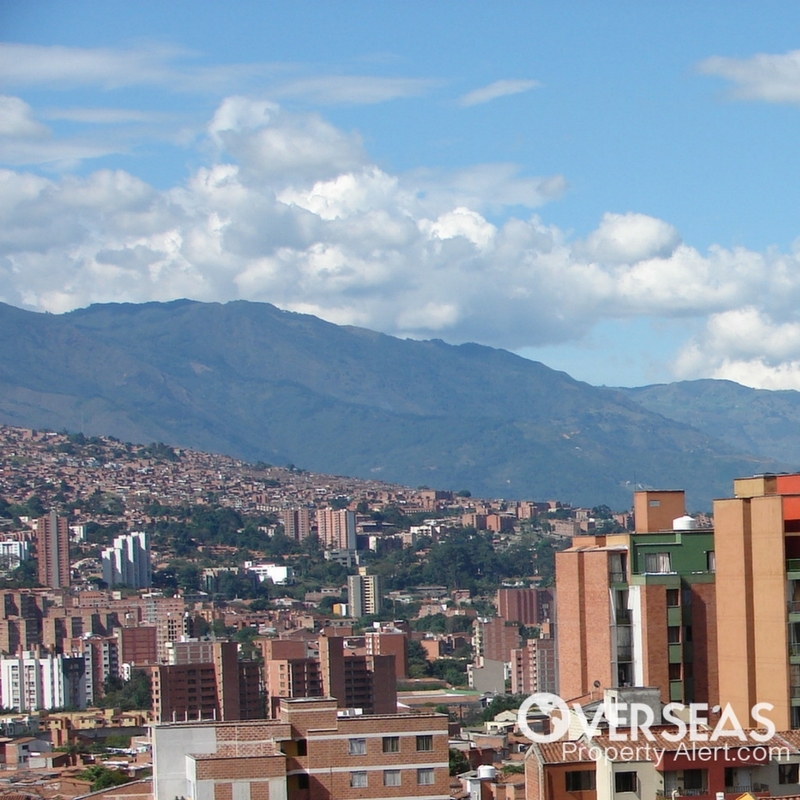 Last week, I saw a report that’s important for anyone who wants to get into Medellín, Colombia’s lucrative rental market… or anyone who wants to rent a furnished apartment for living in this popular expat destination. So, with this rental data in hand, now is a good time to look at my three favorite areas in the Medellín valley to get a picture of today’s rental market. high-end shops. 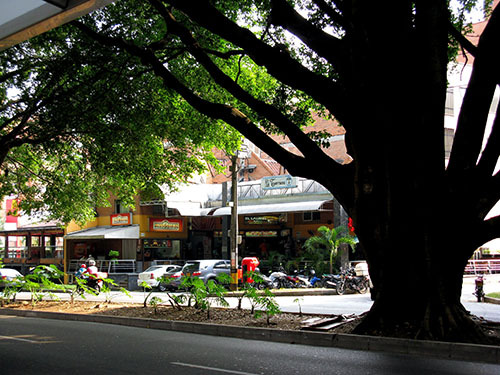 It’s the safest area in Medellín and sees lots of tourism, many entrepreneurs, and a host of business travelers. And while the Zona Rosa is very popular with expats, the majority of the weekend nighttime visitors are young, well-off Colombians. As you can imagine, El Poblado commands the highest rental rates in the city. Here are the averages as of April 2017. At just two blocks from Parque Lleras, I found a roomy, two-bedroom apartment with lots of rental potential. This modern, 128-square-meter (1,377-square-foot) unit includes parking spaces for three cars, two bathrooms, a balcony, an American-style kitchen, and loads of windows. The asking price is US$134,300 at today’s exchange rate (390 million pesos). There’s a three-bedroom, two-and-a-half bathroom apartment for sale near the Golden Mile, with easy walking access to some of the best shopping, banking, and dining in Medellín. The unit has 89 square meters (957 square feet) of living space, with an ample balcony and amazing valley and mountain views from most rooms. The asking price is US$120,600 (350 million pesos). In a very walkable area of Laureles, I found a third-floor, duplex apartment on the market, with 111 square meters (1,194 square feet) of space arranged on two floors, including three bedrooms, two bathrooms, and a spacious kitchen with cooking island. The building is located in the shady restaurant zone of Laureles with easy walking to cafés and shopping, as well as public transportation. The asking price is US$92,000 (267 million pesos). There’s another nice, two-floor apartment available in Laureles, this one occupying the 8th (top) floor of the building. It features beautiful cathedral ceilings over the living area, with skylights on the upper floor. With 120 square meters (1,291 square feet) of living space, including two bedrooms and two bathrooms, the unit has amazing views of the valley and is also in a perfectly walkable neighborhood. The asking price is US$130,900 (380 million pesos). Laureles sees less of a rental demand than El Poblado, and the returns will not likely be as high. But the quality of life is excellent, and it’s an area that’s rapidly increasing in popularity. Envigado also has a character that’s quite different from neighboring El Poblado. 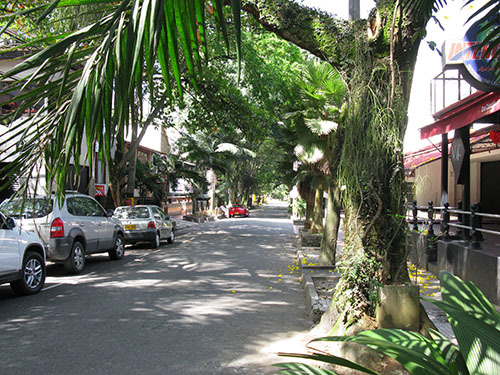 Instead of the upscale feel of El Poblado, Envigado seems more like a comfortable, well-maintained, and older-fashioned environment. When I walk around its quiet, tree-lined streets, I find it has a distinctive “neighborly” or “community” feel. 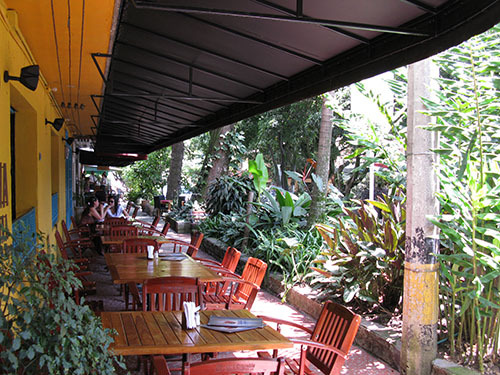 The first time I saw Envigado’s Barrio Jardines, I stood on the corner just a block from the main avenue and just took in the restaurants and cafés heading off in all directions in this cool, relaxing setting. And here are a couple of example properties for comparison. In the popular Jardines neighborhood of Envigado, I found an apartment for sale in a great location, with easy access to public transportation, yet very walkable to Envigado’s restaurant district. The building and its pool area are surrounded by lush tropical gardens and walkways. The 117-square-meter (1,258-square-foot) unit has three bedrooms, two bathrooms, balcony, and well-equipped kitchen finished with hardwood, marble, and ceramic. The asking price is US$96,500 (280 million pesos). In the heart of Envigado, close to shopping, city businesses, churches, cafés, and restaurants, a two-bedroom, two-bathroom apartment is on the market. The unit has 99 square meters (1,065 square feet) of living area, as well as a balcony and covered parking space. The building amenities include ample green space planted with tropical gardens, a gym, two swimming pools, sauna, and 24-hour security. The asking price is US$133,400 (355 million pesos). The 2017 study of furnished rental prices was performed by Jeff Paschke, a digital nomad and colleague who lives and works in Medellín. You can see Jeff’s complete article here. I really enjoy reading the daily posts and have been to several conferences. I have a question and I hope you can help. I am nearing time to retire. I live in a beautiful city in Florida, which I enjoy for about five months of the year… but I suffer through summers with heat and humidity. I have looked at several cities with “eternal spring” weather, places like San Miguel de Allende, Medellín, and Cuenca, and those mountain cities were where I was most interested for retirement. However, I have recently been diagnosed with a chronic respiratory disorder that would be exacerbated by living in high altitude. My cardiologist strongly advises against living somewhere in high altitude. Do you have suggestions for “eternal spring” cities without excessive heat or humidity and which are also at sea level? I’ve faced this same question, and it’s very difficult to find a suitable low-altitude place that has genuinely good, springlike weather all year. The city that came the closest was Viña del Mar, Chile, where high temperatures range from 59°F in the winter to 75°F in the summer (15°C to 24°C), thanks to the moderating effects of the Pacific. Personally, I’d prefer weather that’s a few degrees warmer, and the best answer I could come up with was to have two properties in opposite hemispheres… then you can enjoy two places, each during their absolute best season. My favorite city pair for this was Punta del Este, Uruguay, and Gijón, Spain. And don’t forget Hawaii. While hardly inexpensive, you can find average high temperatures of 79° in the winter and 83° in the summer (26°C and 28°C). I really appreciated your insights on the article comparing Puerto Vallarta and Mazatlán. We’re looking for full-time retirement options in both cities, plus a few other Mexico locations such as Los Cabos. We plan to visit Mazatlán this December to look at places. Can you please recommend a good, honest real estate agent? And if you’re around and have time to meet, I’d love to buy you a cerveza (or two). Yes, to see real estate I’d recommend that you contact my friend in Mazatlán. He’s a long-term expat who relocated here with his young family about eight years ago. If you want to study up on what to expect there, you can see my previous articles on Mazatlán here. And if you’re heading to PV, my Puerto Vallarta articles are here. I have been wanting to move somewhere for some time, like Mexico, Panama, or Ecuador (somewhere with no snow), but we have a major problem. I am 85 and my wife is 72. She had a stroke, is wheelchair bound, and is unable to talk. I had a stroke three years ago, which left no disabilities. Calling 911, I was in emergency within an hour. My wife had to be rushed to emergency recently, and a 911 call also had her in emergency within an hour. These calls saved our lives. Do any other countries offer 911 services? Yes, almost every country in the world has emergency response phone service, so unless you’re moving somewhere like Madagascar, it will be available. As in the United States, the time to get emergency care will depend on the distance to the nearest emergency facility. If you live in a place like Mazatlán, for example, we have an emergency number and a hospital just a few miles away. Keep in mind that the number you dial is not always “911” (the codes 112 and 999 are also very common), and not everywhere has English-speaking operators. If you’re not fluent with the local language, leave a prepared statement near the phone that you can read to the operator. When you land in a new city, one of your first tasks should be to identify the emergency number and the nearest facility. Here’s a list from the U.S. State Department.